Gangwon-do Province is pushing its spirit promotion project aimed to change its negative image - internally and externally - in this boundlessly competitive 21st century. It further aims to encourage the good traits - the simplicity, diligence and tenacity, of its people, - and recover its original identity and elevate its forward-looking spirit, thus firmly establishing a desirable image of the Gangwon people. For the provincial image about-face project, we have first selected 18 famous people of distinctive thought and achievement, in various fields, from throughout the history of our nation. They include those who espoused and practiced a forward-looking philosophy, positive attitude, creative thinking, and handed down great achievements to us. We want to use them as the model on which to establish the identity and independence of the Gangwon people. The project has developed from 1997 to 2004, with a total investment of 35.7 billion won. Specifically, we will create historical sites as we recover the selected figures’ birth places, establish memorial halls and shrines, and create memorial parks. Furthermore, we are pushing to phase in a project to promote their thought on a yearly basis by opening academic seminars, creative wri ting contests and other literary events, and publishing historical data, all geared towards inheriting their spirit. The first phase of the project, which ran from 1997 to 2000, concerned eleven people that demonstrated great feats of patriotism, reform and culture. They include Yu In-seok (pen name Uiam), Yun Hui-sun, Kim Yu-jeong, Won Cheon-seok (pen name Ungok), Heo Gyun (pen name Gyosan), Heo Cho-hui (pen name Nanseolheon), Lee Seung-hyu (pen name Dongangeosa), Namgung-eok (pen name Hanseo), Lee Hyo-seok (pen name Gasan), Han Yong-un (Buddhist name Manhae), and Park Su-geun. The second phase of the spirit promotional project, which ran from 2001-2002, specifically concerned patriotism and culture, and here two persons, Kim Si-seup (pen name Maewoldang) and Kim Byeong-yeon (pen name Nango), will be promoted. 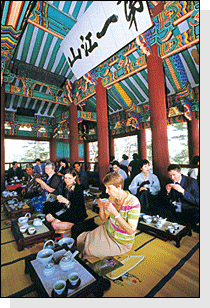 The third phase of the project, which spanned 2003 to 2004, promoted five wise and good-hearted wives and exemplary civil servants, such as Sinsaimdang, Kim Dong-myeong (pen name Choheo), Nam Gu-man (pen name Yakcheon), Heo Mok (pen name Misu), and Park In-hwan. ThePersons of Gangwon affiliated to projects.